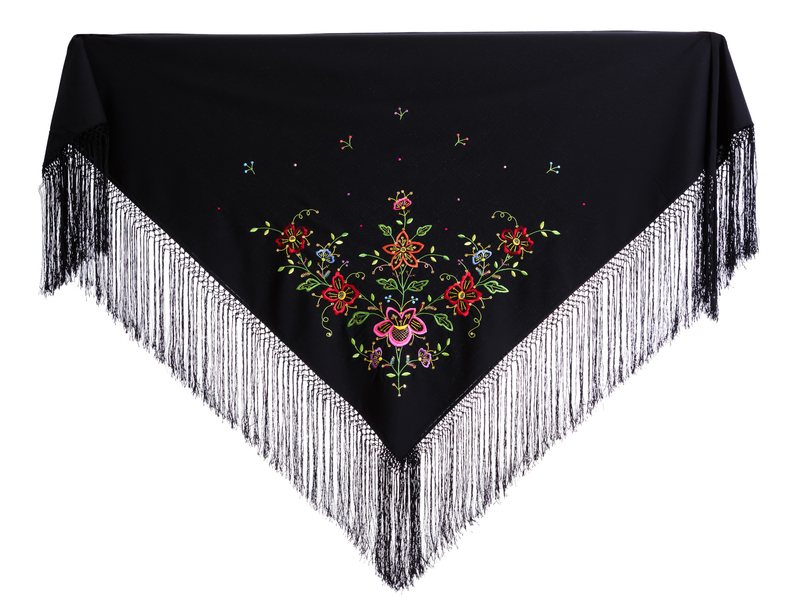 The fine tibet wool shawl has a harmonious floral motif and refined colours, a free interpretation of the traditional local designs by this craftswoman. Entirely handcrafted with silk embroidery technique. 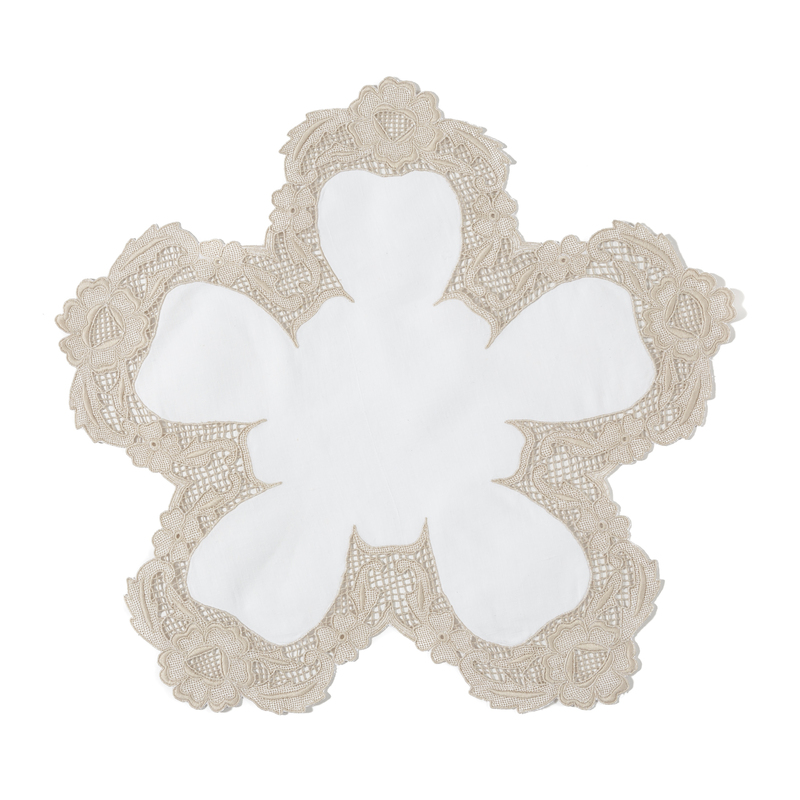 Circular doily with large petals skilfully embroidered according to fine techniques mastered by this craftswoman also on a wide range of dowry artefacts. 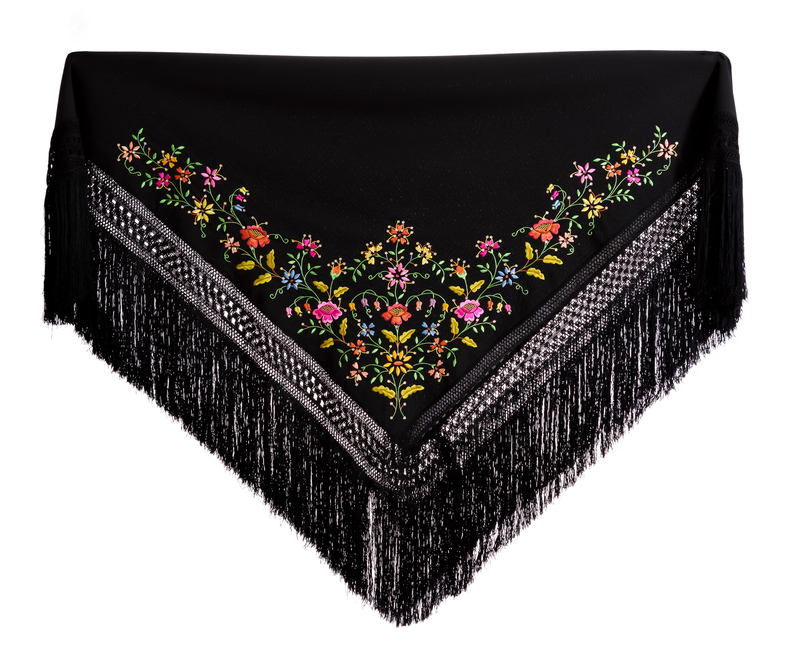 This fine elegant stole in pure black silk has exquisite floral embroidery and refined and colours, a free interpretation of the traditional local motifs by this craftswoman. Entirely handcrafted with silk embroidery technique. Maria Luisa Frongia’s exquisite embroideries preserve an ancient feminine knowledge codified and handed down from mother to daughter, linked to typical customs and colourful traditional Sardinian garments. Thanks to this legacy, Maria Luisa learned the tailoring and embroidery techniques from her mother, creatively using fabrics and yarns even as a child, gradually developing the skilled aptitude of those who master a craft naturally. 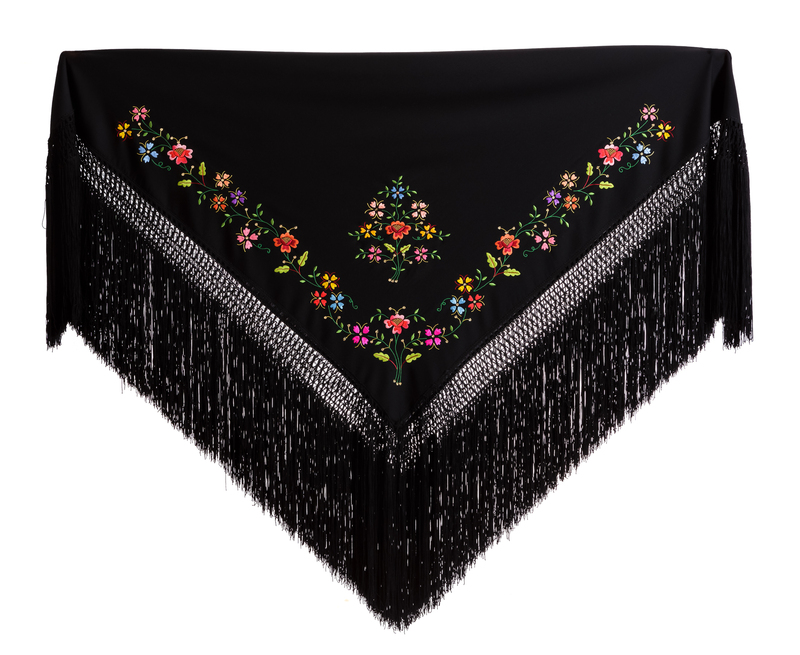 Dedicated to the faithful reproduction of the complex traditional costumes for women and men, her production stands out for its fine thin black woollen fabric shawls, embroidered with brightly coloured and expressively composed elegant floral motifs. Recognised and sought after thanks to her expertise which she puts to use in diverse professional domains such as that of theatrical costume design, Maria Luisa works and exhibits her creations in her pleasing workshop in the historic centre of Samugheo, and every year she participates in the renowned Sardinian Handicraft Fair in her native village, where the excellences of the island craftsmanship are brought together. Maria Luisa Frongia expertly embroiders the wide variety of Sardinian costumes in order to faithfully reproduce the traditional garments, which she tailors in every single stage and which she revisits as contemporary items of clothing such as shawls, stoles and other accessories. She also skilfully embroiders white dowry linen: tablecloths, sheets, curtains and other home textiles, all finely decorated and with customised details. She carefully performs coloured silk embroidery, white dowry linen embroidery and all the stitches typically used to decorate the traditional costume. The cutting and tailoring techniques for traditional costumes are carefully and competently carried out with regard to all the garments that are part of the rich and varied collection of traditional clothing for men and women.